Attractive nest egg that discourages egg eating. Won't break when dropped like ceramic eggs. Also used to encourage hens to lay in a nest box. Used to encourage hens to lay in a specific area or nest box. 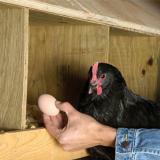 Discourages egg eating (hens are unable to break this egg). Made of Birch. Made in Maine. To use simply place an egg in the desired laying nest. 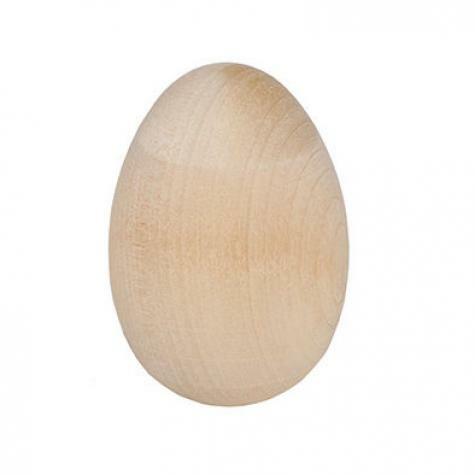 Great quality wooden eggs at a reasonable price. The hens are using the nests very well now that these eggs are there, but the wood grain and feel makes it obvious to us that these are fake, so we don't gather them in the basket. The weight of this product is just right. I highly recommend them. Painted these to match my green chicken eggs & put them in the nest boxes I wanted them to use ! Worked perfectly!! I have a turkey sitting on chicken eggs. Now she sits on her wooden eggs and collecting eggs is not as difficult. She would get so upset! Now the wooden eggs make it easier. I'm so glad I purchased these; haven't had a problem with a chicken breaking an egg since I put them in there. Great product and excellent service. Very pleased! Eggs look great and shipping was fast.